I learn to accept more types of food after I took lunch at school since August. I am drinking some Chinese herbs tea as dessert after I had my meal at school. I especially enjoy eating pasta at school. It will always be 2 bowls. That was since 2 to 3 weeks ago. Then, I was almost taking 2 bowls for every meal in school now since this week. I will surely took 150ml of milk too once I get up to the car and leave the school everyday. Obviously, my tummy will grow so big like it was going to burst any time after I had lunch. Guess what? Mum gets worried. Mummy promises I will print out some of them to display in the album this time. In fact, mummy misses all Lizzy’s baby looks. 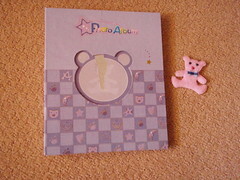 So, mummy wants to own this photo album as mummy can enjoy flipping it every night before I sleep. 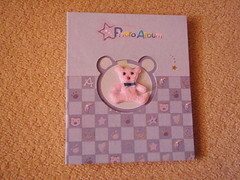 Mummy planed to place the printed out photos in a cute and sweet album, which in purple cheques and a pink bear in the middle. But, look what has little Lizzy done? I think she likes the bear so much. So, she decided to tear it out. How dare you? 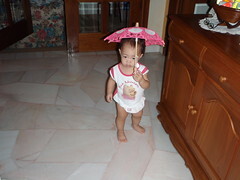 Now is raining season, so Elizabeth need an umbrella too! 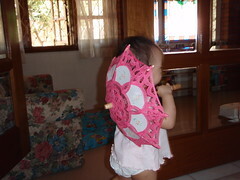 Mummy knows Elizabeth likes umbrella since young. so, mummy bought this back all the way from Hong Kong. 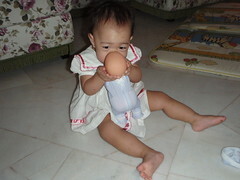 Mummy thought that I can still make it a decorative items at home, after Elizabeth don’t play with it anymore. Can you imagine I jump over the the hand rest of the sofa and straight away fall to the ground in the upside down position? That’s sounds truly, serious isn’t it? That’s something truly scary to mummy, I guess. Of course, I am upset too. There is a red spot immediately appear on my forehead. Thus, I cried out loud. Just for a while. I am so brave, didn’t I? Nope! I miss out something. Mummy manage to catch my leg before I fall. But, her hands finally slip away. So I did fall, but just not as bad as you imagine cause I fall slowly. And, the redness disappear after a few hours. No serious injury at all. No jumping around, please baby! 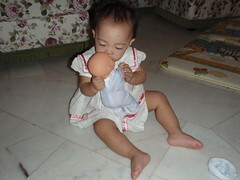 I seldom play with my baby anymore. I know it’s new. But there is nothing much for me to look forward to. However, mummy just can’t forget about how I kiss my baby. I love you, Baby. So… Come on! Let me praise you with a light kiss! Oh! How about a bite? 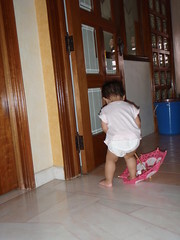 Anyway, I know she is being very kind to my little princess. However, money is always full of germs. Thus, it is not suppose to be in the hand of a little naughty girl who will continuously put her fingers in her mouth every now and then. Oh! Mummy is late for marketing again. Mummy always wake up late when she promise to go to market early in the morning. Partly because mummy sleep quite late at night. But, mostly is all because mummy don’t really like marketing. Since young, mummy don’t like market, especially the fish and pork market. Everywhere is wet and the smells is horrible. Anyway, this is a bad habit. Unfortunately, like mother like daughter. Elizabeth hates marketing as well.